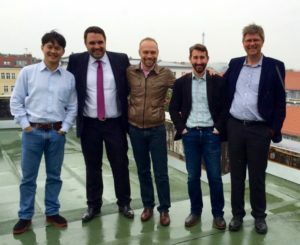 The Berlin start-up Relayr receives 11 million dollars. Kleiner Perkins, one of the wold’s most renowned venture capitalist, is the main investor of the internet-of-things specialists. Harald Zapp and Josef Brunner have secured top-ranking partners for themselves: their Berlin start-up Relayr receives 11 million dollars in an A-series round of financing. The main investor is no other than Kleiner Perkins Caufield & Byers. The Americans rank among the world’s most successful venture capitalists. For example, they were among the first investors of Google, Amazon, Twitter, AOL or Nest Labs. Moreover, Munich Venture Partners and Tom Noonan, as a private investor, also joined the investment round. He founded the energy management company Joulex together with Relayr manager Brunner and sold it for more than 100 million dollars to Cisco two years ago. “I am more than proud that such investors are supporting us,” says Brunner. Relayr develops applications for the internet of things. The Berliners became known through their kit “Wunder Bar”, which resembles a chocolate bar and contains a Wi-Fi master module as well as six small chips. It communicates via Bluetooth and measures the level of sound, temperature, and brightness or sends infrared signals like a remote control. This is how Relayr won the Code_n-start-up competition on this year’s Cebit. However, the kit is just a gimmick to considerably simplify the initial testing of ideas. The actual business model is Relayr’s cloud service. It offers a platform for various Internet-of-Things applications (IoT) and enables different devices to communicate with each other. Some of their clients are, for example, Bosch Siemens household appliances, Cisco, and the city of Paris. 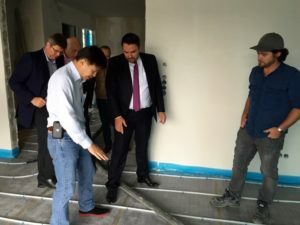 Florian Fritsch and interior construction supervisor Matthew (right) explain to Wen Hsieh (Kleiner Perkins) how the low energy concept of the project will be integrated into the Relayr Cloud. The interest of US-VCS in German start-ups has risen in the past months. Yet, investments of Kleiner Perkins are extremely rare. Amongst the German founders who received funding from Kleiner Perkins are Florian Leibert with Mesosphere or the Datameer founder Stefan Groschupf. However, both of them founded their companies in the United States.